There's more than one way to skin a cat ! How to remove Rega pulleys? An often asked question. My pulley just popped off under finger pressure and I can refit mine if I wanted to. I popped the plastic pulley on my P2 with flat of a screwdriver twisted to exert pressure and it came off fairly easily. When I took off my pulley I put a paint scraper under the pulley to protect the plinth. While I applied heat with a mini torch-directly on top of the pulley, I gently pried upwards with a fork and it came off lickidy-split. 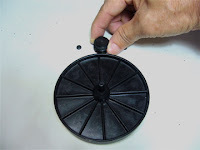 From my own experience, the plastic pulley of Planar 2/3 can be pulled out easily (by hand) without even a drop of acetone. Really easy. 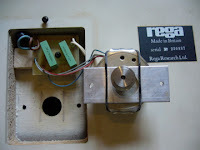 But for Rega P1 and above, we would require some kind of tools to pry out the pulley(after applying some acetone or nail polish removal). For aluminium pulleys (P3-24 and P5 ), it's even more difficult and applying some heat may help in this case. And today we have good news from Thomas of Denmark! only takes a few turns with the puller - and the pulley is up and away! Remember first a little drop of acetone. No scratches on the plinth surface. 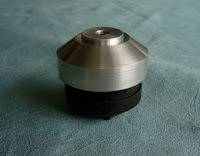 But most important: No harm to the motor, spindle or bearings. spinning just as smooth and quiet, as it always has been. I am sure, you can buy the puller in stores, where they sell repair tools for cars or bicycles. The amount (here in Denmark) was just around 35 USD (200 DKK). I hope, these few guidelines will be a help to upcoming "upgraders" of Rega decks. Thanks , Thomas, for your generosity to share with us the pictures and instructions! 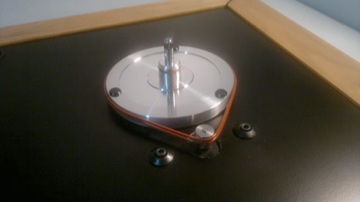 I am glad to receive a mail from Thomas Nielsen of Denmark that my stainless steel double/dual pulley has brought more "PRaT" to his Rega P3-24 turntable. Thank you Thomas, for allowing me to publish your comments to share with others. 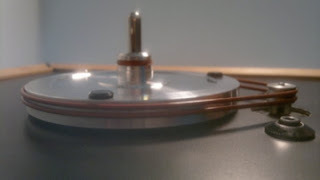 A few days ago, I received the double pulley for my Rega TT. Luckily I could borrow a "professional" mini-puller where I work (a fire-department in Silkeborg), so it was very easy to pull off the stock pulley, without any harm to the motor. Rotation is now rock stable, and maybe for the first time I have recognized the meaning of PRAT. I know, it's said before - but I hear more "layers" in the music, and more than before, I can not only hear, but almost physical "see" through the speakers and into the recording studio! Strange?? But that's a fact! I am sure, I can now look forward to many joyful listening sessions! "PRaT" stands for "Pace, Rhythm and Timing". "PRaT" is definitely not new to any audiophile as in music appreciation and enjoyment, we always hear audiophiles talk about the "musicality" of their systems in terms of "PRaT". The more "PRaT" is taken to be better of course! 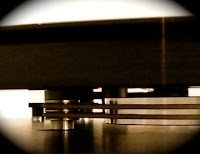 (And many have chosen Rega turntables also because of Rega's "PRaT" factor). "PRaT" also looks like an important parameter to audiophiles for "measuring" the system they are "listening" to. The same is true in tweaking and comparing turntables. When the music is on, how do you react to it? Head nodding.....with the music ? Feel like humming and dancing along..... with the music......? Simply want to listen and enjoy more.... and more..... of the music.......? A popular turntable in the 70's, Rega Planar 3 is more than thirty years old now. Leaving the age aside, it does not lose out to some of the new Regas in appearance and in performance. If we were to compare, we would find Planar 3 and the new models not only basically look similar, there's not much difference in design and construction other than the upgraded motor in later models. Many analog enthusiasts today still regard Planar 3, with 18 mm diameter heavy duty main bearing housing, a good-sounding turntable and would rather restore or upgrade a Planar 3 than to get a new RP1, P1, P2 or even P3........ . If you have a Planar 3 or Planar 2 that's not modded, here's the tips for substantial sonic improvement with simple upgrades! 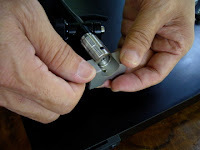 In this post I am going to show you step by step upgrades for a Rega Planar 3 turntable since I have received many enquires particularly on motor base upgrade for this turntable. I will also include all other possible mods for easy reference at a glance. Hope it would be helpful to those who are going for these Planar 3 tweaks. 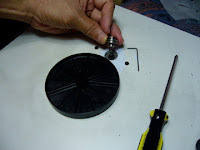 For most Planar turntables, the pulley which is glued down on the spindle is easily removed by hand as the glue has deteriorated over time. 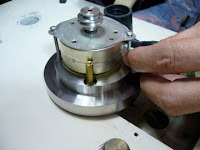 Fix the stainless metal pulley ( standard or dual) after applying a bit of light oil on the spindle. 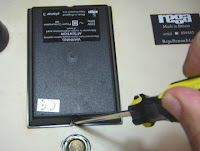 Tighten the set screw with allen key. Unscrew the two black screws to loosen the motor mounting bracket. The motor which is held by rubber band to the bracket is now loosely cradled within the motor compartment by the back cover. 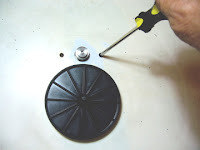 iii) place a piece of cloth (or any soft material) of sufficient thickness on top of the the sub-platter to block the sub-platter and bearing from falling out when the turntable is turned over. 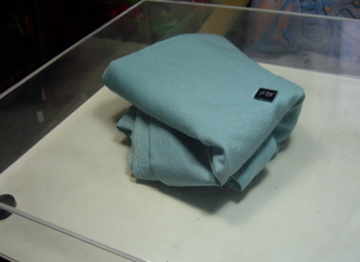 With the cloth in place, close the lid. Put the turntable upside down on the work place such that it rests on the lid. Open the motor compartment using a suitable screw driver. Now you can see how the motor is held by elastic band to the plinth and what it's meant by the motor "sways (wobbles) with music" which results in speed inconsistency and affects the performance of the turntable. Remove the motor mounting bracket and elastic band. 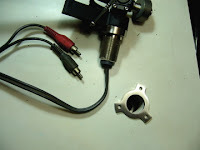 Bend the motor flange upwards using the pliers such that it is level with the top surface. No need to be perfect. Before we go to the motor isolation base, snap in the thrust bearing to the bottom of the motor after adding two or three drops of light oil. It's simple (as shown in the picture). Tape the motor wires with electrical insulating tape for insulation as well as preventing the motor vibration from reaching the board. 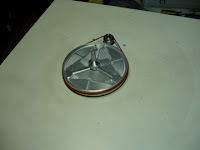 Place the motor onto the motor base and align the mounting holes of the motor flanges with the thread holes on the base. 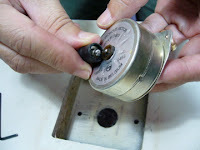 Use the screws provided to hold the motor tightly in place. Remember to tighten the screws alternatively between the motor flanges to ensure even pressure being applied on both sides. Use the plastic bracket and the screw to hold down the rubber mesh netting on one side first (next to the brass bearing housing) before putting back the motor base/motor. Put the motor back to the motor compartment. 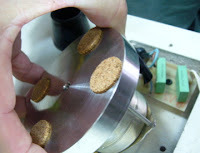 Affix the cork stickers to the motor base as shown. 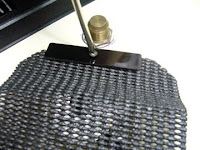 Cover and secure the other side of the rubber mesh netting with plastic bracket and screw. The rubber mesh netting should be a bit slack (7-8 mm) such that in upright position, the motor is not touching the plinth and the pulley stays within the pulley hole when the turntable is lifted up . Change the original rubber feet to the new taller ones as shown. You may use the original mounting screws . Alternatively, you can upgrade to aluminium feet (à la P7/P9) using existing rubber feet for better turntable isolation. Turn over the turntable now. Align the pulley in the centre of the hole making sure the whole assembly (pulley+motor+motor base) is not in contact with any part of the plinth. The pulley grooves (and the belts) should aligned within +- 4 mm higher or lower from the centre of the sub-platter. Put the silicone belt on to test. Fine adjustment in pulley height might be required to align the pulley with different types of sub-platters you used. Stainless steel or brass washers (50 mm( 2") x 2 mm) could be used between motor and motor base to adjust the height of pulley assembly if necessary. Replacing the original resin sub-platter with anti-resonance aluminium metal sub-platter is a breeze. Remember to oil the stainless steel shaft with suitable lubricant before inserting it into the brass bearing housing. I am sure everyone knows what to do with this 24 mm acrylic platter. 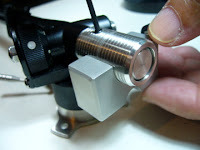 Loosen the tonearm cable clip and turn the adjustable spanner anti-clockwise to loosen the tonearm hexagonal nut in order to remove the RB300 tonearm. 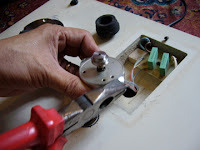 Remove the tonearm from board. Put the serrated 3-point spacer in place. 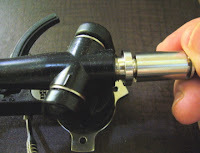 Put back the tonearm and hand-tighten the nut(+1/4 turn). 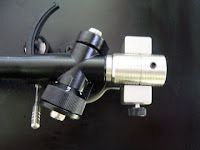 The serrated stainless steel spacer now semi-decouples the tonearm from board while enhancing the rigidity. 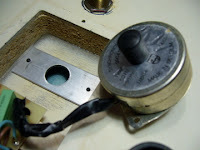 Lastly, fix the anti-resonance adaptor for counter weight with allen key. Adjust the underslung counterweight with help of a stylus tracking force guage. Besides the above upgrades, you may add a suitable isolation platform of your choice. Now you have a capable audiophile machine to enjoy beautiful analog music. It will sound as good as many more expensive models of turntables you find in the market! 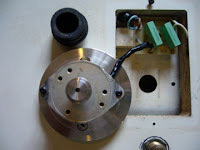 "Now, all the items (Motor base, dual pulley, silicone belts, aluminum feet and thrust bearing) are installed (takes about 1h) and it sounds fantastic (great mids and straighter bass)!" "1) No more wow from the bend in the white belt. 2) Speed seems very stable. I have not been able to hear any "macro" pitch issues, meaning, to me, no audible pitch fluctuation. Basically no wow. I am no longer frustrated with records! I was getting to be quite good at hearing very subtle pitch fluctuations. 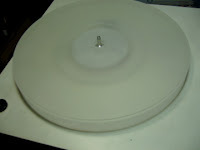 3) The turntable is more quiet and clear. It seems easier to hear and enjoy the music at both low and high volume levels. At higher levels, it's easier on the ears and at lower levels its easier to hear. 4) All the important musical stuff better: instrument timbre, attack, detail. 5) Sounds like I went up to a better class of turntable. Overall, I'm very happy with the improvement and I think it was a good value for what I got. " Unlike the other earlier models of Rega turntables, including its predecessor P25 TT, P5 turntable comes with a different pulley. Its aluminium metal pulley does look better and it's believed to perform better than the plastic ones also. But by replacing the aluminium pulley with stainless steel dual pulley and spinning the sub-platter with higher energy and hence steadier speed using twin silicone belts, many P5 owners discover great sonic improvements in P5. What can I say, after two weeks using the dual pulley + silicon belts upgrades is that the improvement is stunning!!! Reaches full speed more quickly and remains there. When the music starts, everything is well defined and sounding like it should. Excellent separation of instruments. Piano and string instruments sound very clear. One of the best upgrades available for Rega tables. No doubt about it! First remove the steel counterweight by turning it anti-clockwise until it is completely out. 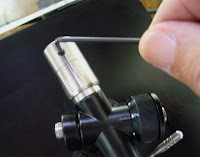 Next, hold the end-stub firmly and unscrew it gently out of the tonearm. 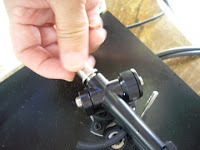 Make sure the tonearm is locked before applying force to the end-stub. Remove the stainless steel counterweight first (refer to above). 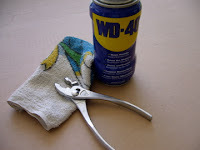 Spray some WD40 at the joint between the end-stub and the tonearm. Wait for several minutes for chemical to work its way into the thread. 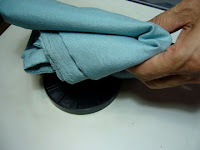 Then cover the end-stub with a piece of thick rag. 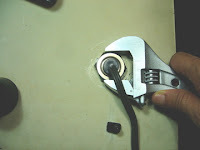 With one hand holding the tonearm firmly, the other hand grabs the end-stub with the pliers and turn (as shown in the picture) anti-clockwise with enough force to loosen it. Normally one turn is enough to loosen the end-stub. However, for some stubborn units, you may need to make one extra turn in order that it's fully loosened to be unscrewed out by hand. 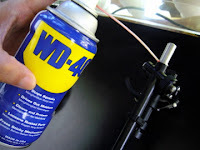 Spray a bit more of WD40 if necessary. Fix the new stainless steel end-stub by turning it clockwise until hand-tight. 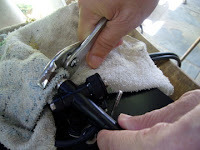 Install the adaptor tube and lock it with the Allen key provided. Slide in the stainless steel underslung counter-weight. Adjust the VTF ( vertical tracking force) by moving the weight to-and-fro along the tube. Lock it at the right position.